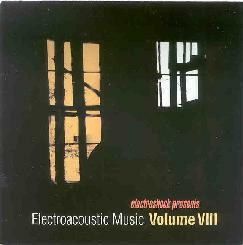 Various Artists - "Electroshock Presents: Electroacoustic Music Vol. VIII"
There are several North American entries this time around (4 USA and 1 Canada). Lisa Walker is the Canadian entry, creating beautiful space ambient music with a seductive drifting string section. Vivain Adelberg Rudow's contribution is a surreal and zany organ and electronics piece. Robin Julian Heifetz offers one of my favorite tracks, being an intensely thematic classically influenced orchestral piece. The music is dark, potent, image inducing, and is continually evolving and shifting gears, ultimately bursting the mercury for pure powerhouse aggression. Like Fantasia for the avant-garde. Christopher Andrew Arrell gives us a short sound collage track that is dominated by the interaction of multiple voice samples. And Gary Di Bendetto creates an ambient backdrop and heavy drones that provide the foundation for a splashing water sound art monologue. Interesting but it doesn't justify its nearly 13 minute length. From France, I was pleased to see Claire Laronde return. Her entry on the last Electroshock compilation was my favorite of the set, and once again she offers a piece that stands alone among her fellow contributors. Her intricate piano work is a delight, drawing on classical and jazz influences, morphing the styles into something accessible but firmly in the avant-garde. Milica Paranosic is a Yugoslav musician (strange that someone would still consider themselves as being from "Yugoslavia") whose entry consists of ambient music with a symphonic edge, intense orchestrations, playful pastoral scenes, and interesting vocalizations á la Laurie Anderson. Jukka Ruohomaki (Finland) offers ambient explorations with a narrative feel, sort of like some cosmic urban landscape. Very subtle but lots happening. And speaking of urban landscapes, Diego Minciacchi's (Italy) entry is a sound collage work in which I felt like I was sitting by the roadside watching urban activities as they were being manipulated and distorted. Crowd noises, footsteps, the sounds of a railroad yard, heavy machinery, and a parade of sound efx that would land Minciacchi a job in Hollywood. Another one of my favorites. And finally, Chaos As Shelter is the moniker used by Israeli musician Vadim Gusis who presents an interesting drone and clattering sound piece. As usual, Electroshock has released yet another highly recommended compilation featuring a diversity of artists.